Despite major advances in ocean observing capabilities, characterizing the vertical distribution of materials in the ocean with high spatial resolution remains challenging. 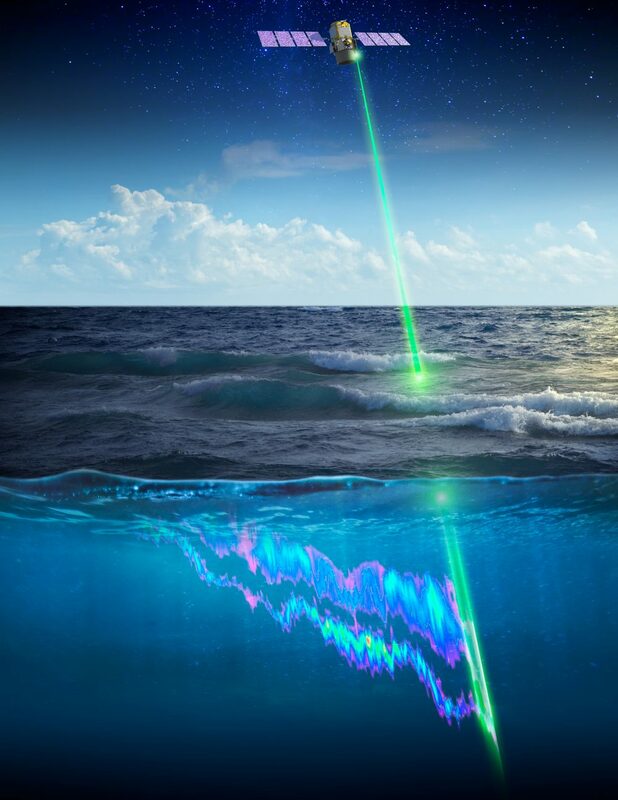 Light Detection and Ranging (LiDAR), a technique that relies on measurement of the “time-of-flight” of a backscattered laser pulse to determine the range to a scattering object, could potentially fill this critical gap in our sampling capabilities by providing remote estimates of the vertical distribution of optical properties and suspended particles in the ocean. 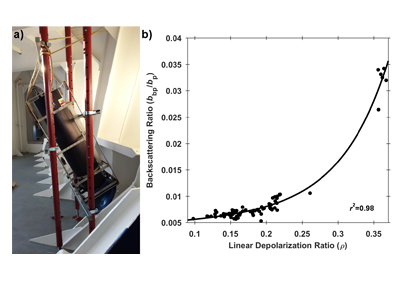 A recent article in Remote Sensing of Environment details the development of a portable shipboard LiDAR and its capabilities for extending high-frequency measurements of scattering particles into the vertical dimension. The authors deployed the experimental system (shown in Figure 1a) during research cruises off the coast of Virginia and during a passenger ferry crossing of the Gulf of Maine (associated with the Gulf of Maine North Atlantic Time Series program-GNATS). Remote measurements of LiDAR signal attenuation corresponded well with simultaneous in situ measurements of water column optical properties and proxies for the concentration of suspended particles. Interestingly, the researchers also observed that the extent to which the return signal was depolarized (also known as the LiDAR depolarization ratio) may provide information regarding the composition of particles within the scattering volume. This is evidenced by the strong relationship between the depolarization ratio and the backscattering ratio, an indicator of the bulk composition (mineral vs. organic) of the particles within a scattering medium (Figure 1b). Figure 1. a) LiDAR system deployed to look through a chock at the bow of the M/V Nova Star. 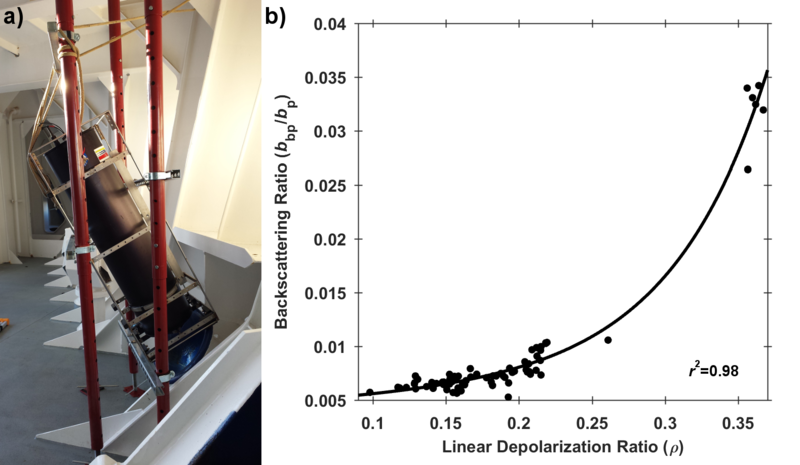 b) Relationship between the LiDAR linear depolarization ratio (ρ) and coincident measurements of the particulate backscattering ratio (bbp/bp). The black line represents a least-squares exponential fit to the data. As LiDAR technology becomes increasingly rugged, compact, and inexpensive, the regular deployment of oceanographic LiDAR on a variety of sampling platforms will become an increasingly practical method for characterizing the vertical and horizontal distribution of particles in the ocean. 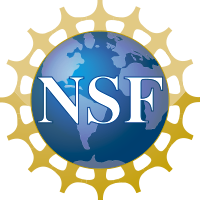 This has the potential to greatly improve our ability to investigate the role of particles in physical and biogeochemical oceanographic processes, especially when sampling constraints limit observations to the surface ocean. What controls annual cycles and interannual changes in polar phytoplankton biomass? 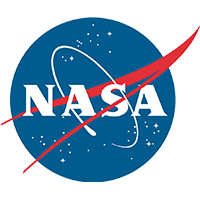 Answers to this question are now emerging from a satellite light detection and ranging (lidar) sensor, which can observe the polar oceans throughout the extensive periods when measurements from traditional passive ocean color sensors are impossible. The new study uses active lidar measurements from the CALIOP satellite sensor to construct complete decade-long record of phytoplankton biomass in the northern and southern polar regions. Results of the study show that annual cycles in biomass are driven by rates of acceleration and deceleration in phytoplankton division, with bloom termination coinciding with maximum division rates irrespective of whether nutrients are exhausted. The study further shows that interannual differences in bloom strength can be quantitatively related to the difference between the winter minimum to summer maximum in division rates. Finally, the analysis indicated that ecological processes had a greater impact than ice cover changes on integrated polar zone phytoplankton biomass in the north, whereas ice cover changes were the dominant driver in the south polar zone. Despite being designed for atmospheric research, CALIOP has provided the first demonstration that active satellite lidar measurements can yield important new insights on plankton ecology in the climate sensitive polar regions. 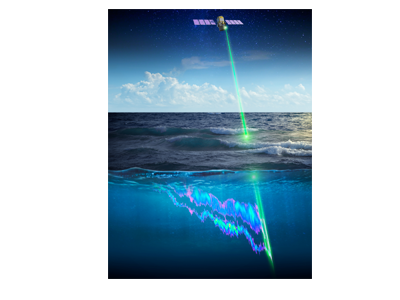 This proof-of-concept creates a foundation for a future ocean-optimized sensor with water-column profiling capabilities that would launch a new lidar era in satellite oceanography.